Leading Exporter of electronic dc injection brakes and electronic regenerative brakes from Mumbai. We offer premium quality Electronic DC Injection Brakes for AC Motors. These brakes have been designed for fast stopping of AC Motors with large . They are applicable in grinding machines, roller table drives, blowers, fans and shot blasting machines. The application frame also includes general industrial applications and saw mills. We offer them at industry leading price. We offer wide assortments of Electronic Regenerative Brakes for the valued customers. These are a kind of electronic devices convert kinetic energy to electrical in different application areas. We manufacture them by the use of finest quality raw materials and sophisticated machinery. These brakes are highly efficient and self-synchronizing. They offer user friendly installation as they do not ask for any programming. 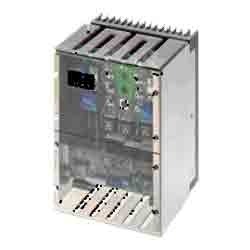 Looking for Drives and Inverters for HVAC and General Applications ?